Convert DVD / Rip DVD / Convert Video to any popular video format. Socusoft photo to video converter professional allows you to create all kinds of eye-catching theme videos ( mp4, flv, mov, avi, mpeg, h.264 HD, 3gp, 3gpp2,mkv, h.264, swf) playable on YouTube,Facebook,MySpace, iPod,iPad,iphone,website,PSP,Archos. With the photo to video converter professional,you could easily build animating theme video and share the video on YouTube, Facebook,MySpace,iPod,iPad,iPhone,PSP,Archos,. With a few minutes of work, you'll have an eye-catching slideshow video with background music and dynamic transition effects. This powerful Photo to video converter supports Over 260 amazing transition effects with Pan & Zoom effect. With photo to video converter,thousands of photos from festival days,vacationss, landscapes, wedding or family parties can now be converted to videos like mp4, flv, mov, avi, mpeg, mkv h.264 HD, 3gp, 3gpp2 and enjoyed on YouTube,Facebook,MySpace, iPod,iPad,iphone as amazing slideshows. The Photo to Video Converter's simplified three-step workflow enables users of all levels to create customizable slideshow video for sharing onYouTube,Facebook,MySpace, iPod,iPad,iphone with family, friends, customers or schoolmates. Photo to video converter Professional gives photographer,photography lovers a new and easy way to view,backup and share their pictures from digital camera, scanner or Internet. With just a few simple clicks, you can use this photo to video converter to add photo, organize your photo album,edit photo,add background music and transition effects, encode your photo album to mp4, flv, mov, avi, mkv, mpeg, h.264 HD, 3gp or 3gpp2 format video files. Then,you can share your videos on YouTube,Facebook,MySpace, iPod,iPad,iphone,Zune,Archor with the format like mp4, flv, mov, avi, mpeg, h.264 HD or 3gp. 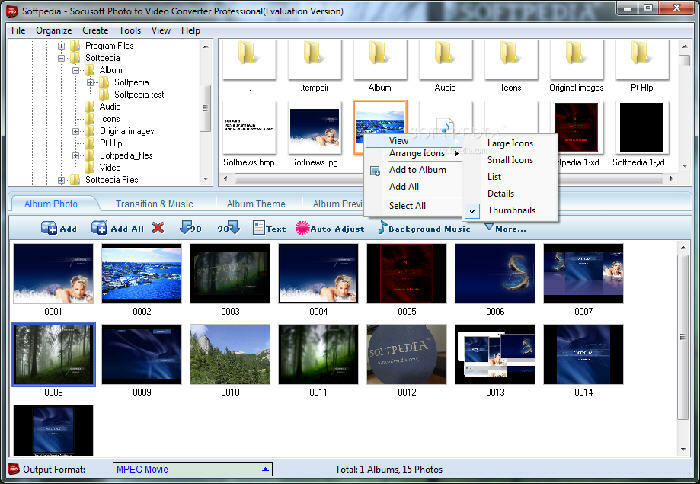 Photo to video converter professional is an easy-to-use vide slideshow maker.With a few simple clicks, you can easily convert still photo to various format dynamic video for playing on the video sharing website like YouTube, Facebook, MySpace. By using the photo to video converter Professional ,You can add photo and create photo album,choose the photo video theme and convert photo album to video with the output formats like mp4, flv, mov, avi, mkv, h.264, 3gp for YouTube, Facebook, MySpace. With this poweer Photo to Video Converter Professional software, you may easily enjoy your animating photo slideshows on iPad, iPod, iphone, blackberry cell phone, PSP or other mobile device. You can collect your still photos from wedding, parties, Christmas, vacations or landscapes, then import them to the photo to video converter software for converting. With just a few simple clicks,you can convert photos to the proper format video ( mp4, flv, mov, avi, 3gp, mpeg, mkv, h.264) that can be played on the iPad, iPod, iphone, PSP. With this Photo to video converter Professional, you can backup thousand of still digital photos easily by converting photo to various video formats like mp4, flv, 3gp, mkv, mov, avi, mpeg-1, mpeg-2, 3gpp2, h.264. And you can also share your creative eye-catching photo slideshow video with your friends, family or customers on TouTube, Facebook, MySpace, iPod, iPad, iPhone blackberry cell phone, PSP, Archos or other mobile device.